Why does the American political system work the way it does? This major revision brings a renewed focus to the institutions, processes, and data that illuminate big questions about governance and representation in the United States. With a new adaptive learning tool, this edition does more than ever to help students understand how American government developed over time and how it works today. Throughout the text, the authors use the themes of representation and governance to frame important questions about American politics. This helps students see how institutional rules and structures, history, and empirical evidence lead to a deeper understanding of the major topics in American politics. 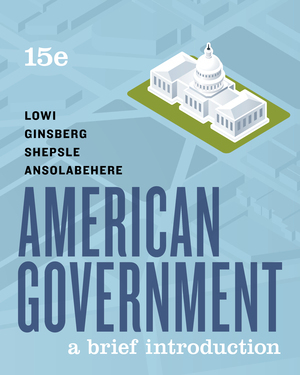 Known for its strong coverage of the Constitution, federalism, and the evolution of the major institutions of government, the text also incorporates recent scholarship on patterns and events that have shaped the political system and policy outcomes. Unique “Timeplot” infographics highlight the historical data that put current events in context. Chapter 13 on economic and social policy has been reconceived by contributing author Elizabeth Rigby (George Washington University) to reflect recent scholarship and current issues—and to explicitly build on what students have learned about institutions and processes in earlier chapters. In all 14 chapters, “Policy Principle” boxes (many new or updated) provide brief case studies that apply key concepts to recent policy issues. The Norton suite of student resources includes study tools that help students understand the reading and apply what they’ve learned. This ensures they arrive better prepared for lecture. Assessing students is easy with the variety of activities built specifically to complement the book. This completely redesigned text now comes in several printed and digital formats to suit every student’s needs.